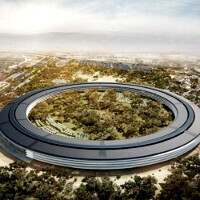 The updated plans for Apple's new headquarters, the roof of which will be entirely covered in solar panels, has been submitted for further consideration to the Cupertino council, revealing a rather Zen future for Apple employees. Inspired by the work of the young Steve Jobs in an orchard pruning trees, the center of the campus will be lined up with plum trees, which will start to blossom in late February, around SJ's birthday in pink and white. Afterwards in March and April it will be the turn of cherry trees which will line up the walkways. Apricot trees will finish the fruit blossom symphony when the summer approaches, and in the center of the "spaceship" headquarters there will be an orchard of... you'll never guess... apple trees, surrounding the dining terrace. Hopefully the Pentagon, which many say Apple's HQ resembles, doesn't pick any ideas for its own inner courtyard, as the respect for our military will be significantly affected. Keep the hotdog stand there and all will be fine. Apple's upcoming headquarters will have the research facility with restricted access from the rest of the building (and probably guarded more securely than the Pentagon), as well as separate auditorium for its glitzy media events with separate parking for the press, and underground tunnel for access from the main campus. A huge fitness center and several dining places, as well as a fountain and open-air amphitheater come standard, of course, for those in the exclusive club of Apple employees in Cupertino. The people at apple do realize he's not god right? Well, obviously he is, because only evidence of any god was allways in worshiping by the masses. SJ definitely has that, so he could be called a God. In the world of Apple, he is god. The company would have probably closed up shop had he not come back and did some drastic things. I don't think Apple could get away with not honoring him in some way. He may not be your personal hero, but for those who probably could have lost their jobs all those years ago, he is a savior. It's funny they are putting fruit trees there. They say they are cherry & apricot trees, but we all know it's the forbidden fruit! So they can all eat & be brainwashed together. Right? To me it all looks kinda fishy. This looks more like a place of worship than a place of work. what if they are building the rest of the space ship underground so no one can see it. & the part you see is the top part of the ship! I wonder what will be the maintenance cost for such headquarter? Awesome design. If you wanna know more about the space ship:http://9to5mac.com/2011/12/07/at-around-5mw-apples-new-solar-roof-could-make-it-the-biggest-in-the-us-power-a-million-appletvs/#more-117520 also it containes a vid. God def not. Devil, quite possibly. No wonder all of the iFanatics come over to the discussions on Android-related articles and go into attack mode... all the Fandroids are over here assaulting the memory of most iFans' favorite person. So I try to have a decent, rational conversation back on an Android-related thread of interest to me, and then I get slashed at, and lumped in with the stereotypical Fandroids... thanks to all the antagonizing Fandroids stirring up the iFans like a hornet's nest... It would be nice to not have to deal with this stupid flame war... If the Android folks could just accept that the iOS folks like their iPhones and iPads, and the iOS folks could accept that the Android folks like their Android phones and tablets... without the Android folks trying to explain why iOS folks are mindless zombies who overpay for everything, and without iOS folks trying to explain why Android folks had better call Steve Jobs their daddy or else. Nobody's crap doesn't stink here, and I don't see anyone walking on water, either. Now, having lived near Cupertino many years ago, I must say that design there is quite shnazzy-lookin'... not a bad idea. And it is huge! I wonder where they will find the space for it, since San Jose's suburbs were rather packed last time I was out there. Either way, that's gonna be a cool looking building.